Jean Lichty, Annette O'Toole, and Kristine Nielsen in A Lovely Sunday for Creve Coeur. Photo by Joan Marcus. BOTTOM LINE: This rarely-seen Tennessee Williams play is a treat. A Lovely Sunday for Creve Coeur is a one-act by Tennessee Williams, written near the end of his life. Presented by La Femme Theatre Productions, Creve Coeur introduces audiences to a Williams play they may never have heard of. In a 1937 St. Louis tenement apartment, not unlike the one occupied by The Glass Managerie's Wingfields, we meet Dorothea (Jean Lichty), called Dotty, and Bodey (Kristine Nielsen), roommates who are middle-aged and single. Though flavors of Glass Menagerie are woven through the play, Creve Coeur is mostly a comedy. It’s all a bit farcical as we watch schoolteacher Dotty diligently doing her exercises (toe touches, hip swivels) and shouting across the apartment to Bodey, who is cooking fried chicken for their much-anticipated Sunday picnic at the nearby Creve Coeur park. All Bodey wants to talk about is her twin brother Buddy and the picnic, and all Dotty wants to talk about is her boyfriend, Ralph Ellis, the principal at her school. Helena (Annette O’Toole), a glamorous and well-off colleague of Dotty’s, shows up unannounced, creating a new layer of tension. She is instantly haughty and judgmental. Helena wants to pull Dotty out of the shared apartment, and into a duplex in a more fashionable area of St. Louis. Miss Gluck from upstairs (Polly McKie), a friend of Bodey's, is the play's fourth character; she is suffering from depression after the recent death of her mother. Lichty believably plays a lovesick Southern belle, and Nielsen brings her trademark absurd comedy to the role of Bodey. O’Toole is especially funny as she grows increasingly frustrated with the whole situation. It's a particular delight to watch O’Toole and Nielsen face off; their chemistry is one of the most satisfying aspects of the production, though the production is strong overall. 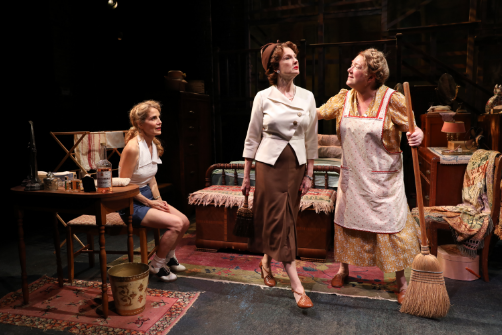 Director Austin Pendleton emphasizes physical comedy as new characters are introduced into the small space (eclectically decorated and lit by Harry Feiner), and new twists of the plot are revealed. Yes, Creve Coeur may be a comedy, but it’s still a Tennessee Williams comedy, so all the facts of the matter are slowly revealed over the course of the nearly two-hour run time, building suspense as we find out what’s really going on in Dotty’s life. And to be clear, the stakes are real. Pendleton keeps a lighthearted tone to counter-balance the seriousness of these women’s predicaments, but doesn’t allow the farce to throw the story off-course. A Lovely Sunday at Creve Coeur may not be replacing Streetcar or Menagerie in high school curricula any time soon, but it is certainly worth a few hours of your time. It’s a must for any Williams completist. A Lovely Sunday for Creve Coeur is by Tennessee Williams. Directed by Austin Pendleton. Set and Lighting Design by Harry Feiner. Sound Design and Original Music by Ryan Rumery. Costume Design by Beth Goldenberg. Wig and Hair Design by Leah Loukas. Dialect Design and Dramaturgy by Amy Stoller. Fight Director is Ron Piretti. Production Stage Manager is Marci Skolnick. The cast is Jean Lichty, Polly McKie, Kristine Nielsen, and Annette O'Toole.